The title contenders have started strongly into the tournament at the IFA 2018 Women’s World Championship in Linz, winning their respective matches. Defending champion Germany showed excellent performances in its two games in Group B against the Czech Republic and Italy, respectively, losing all together only eight points. The Argentinian team also drove home two victories against the Czech Republic and Serbia, respectively – the Argentinians are thus currently on the second place in the group. The newcomers from Serbia, Poland and New Zealand impressed with strong matches. 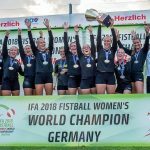 New Zealand’s defense delivered a strong performance against 2016 vice world champion Brazil, preventing several Brazilian points in a spectacular manner. Poland came out well of the starting block, winning a set against Italy. In particular impressive was the Serbian team – the team of coach Ivan Milenkovic was able to win a set against the experienced Argentinian team. In their match against Poland, the Serbian squad scored its first victory in an international tournament. The other newcomers – Poland, New Zealand and Belgium – will try to emulate the Serbian success tomorrow when the tournament continues with 14 matches, starting at 1 pm.